An architect’s rendering shows a proposed elevated boardwalk over the Charles River as part of a Mass. Pike redesign in Allston. 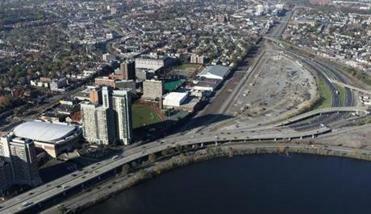 AS THE STATE Department of Transportation continues to mull how best to re-route an elevated section of the Mass. Pike in Allston to satisfy its many stakeholders — drivers, taxpayers, neighbors — it is instructive to consider the crumbling viaduct’s origins. Back in 1962, when the Pike was extended from Route 128 to South Station, the Turnpike Authority’s original plan was to push Soldiers Field Road out into the Charles River and build the Pike extension at grade level in place of the parkway. In order to accomplish this, however, the Turnpike Authority needed to fill 11 acres of the Charles River in Boston and excavate the Cambridge side, seizing land controlled by the former Metropolitan District Commission through eminent domain. According to the long memory of former transportation secretary Fred Salvucci, and confirmed by a dig through The Boston Globe’s archives, the MDC refused to cede the land, and a classic legal and political turf battle ensued. Eventually the state Supreme Judicial Court got involved, ruling that both agencies had equal powers of eminent domain, so they could conceivably keep seizing and re-seizing the contested property from each other ad infinitum. In a fit of pique, Turnpike Authority chairman William Callahan abandoned his plan, opting instead to build the costly, congested, 3,000 foot-long elevated eyesore we know today. The area under and just east of the viaduct is known as “the throat,” because of the way it is squeezed between the river, rail yards, and Soldiers Field Road. Transportation advocates have been pressing MassDOT to see the billion-dollar Pike redesign project as an opportunity to “unchoke the throat” by widening pedestrian and bicycle paths, adding a landscaped buffer from traffic, improving public transit connections, and knitting together the south side of Allston with the burgeoning new enterprise campus Harvard University is building to the north. It was bad enough the first time Boston built a whole new neighborhood and forgot about transit. Un-choking the throat doesn’t require that the viaduct be removed and the Pike re-routed at grade, but doing so would be vastly better for river access, and, advocates say, cost about $100 million less than reconstructing the viaduct. One option DOT is considering to rebuild the viaduct actually adds lanes, ostensibly as a safety enhancement, though it would likely just enhance the highway’s speed. Of course, the throat area is only part of a massive untangling of the Allston-Cambridge interchange and straightening of the Mass. Pike that will take years to complete, but MassDOT has assigned some urgency to the viaduct solution, putting it in Phase 1 of the project. Back in the 1960s, when the Turnpike Authority opted for the viaduct in its dispute with the MDC, the Globe’s headline read “MDC Wins River Row.” But the citizens of Greater Boston really were losers, inheriting an ugly gash through the city that aggravates noise and air pollution and costs $800,000 a year just for maintenance. The state’s transportation planners should seize a new day and not double down on the mistakes of the past.